U2 bassist Adam Clayton thanked his bandmates for their support during his treatment and recovery for alcohol abuse. IN A FRANK and heartfelt speech, U2 bassist Adam Clayton thanked his bandmates of four decades for their support during his treatment and recovery for alcohol abuse years ago. “We have a pact with each other,” Clayton revealed as he was receiving an award from MusiCares, the charity arm of the National Academy of Recording Arts and Sciences. At that, his bandmates came out to join him, performing Stuck in a Moment You Can’t Get Out Of, Vertigo and I Will Follow. The evening at the PlayStation Theatre in Times Square also featured performances by rapper Michael Franti, Jack Garratt, reggae singer Chronixx, Macy Gray, and The Lumineers, who are currently appearing with U2 on their Joshua Tree tour. Clayton was introduced by British record producer Chris Blackwell as someone who “lived through addiction and came out the other side, and has been courageous enough to admit it”. I’m an alcoholic, addict, but in some ways that devastating disease is what drove me towards this wonderful life I now have. It’s just that I couldn’t take my friend alcohol. At some point I had to leave it behind and claim my full potential. He said part of the reason he had a hard time quitting drinking was that he “didn’t think you could be in a band and not drink”. “It is so much a part of our culture,” he said. “He didn’t sugarcoat it. He told me that I needed to change my life and that I wouldn’t regret it,” Clayton said. As for his bandmates, Clayton said: “I was lucky because I had three friends who could see what was going on and who loved me enough to take up the slack of my failing. Arriving at the theater earlier, he told reporters the fund was especially important given the current epidemic of opioid addiction. “MusiCares … really provides funding for a lot of people to look into those things and find help,” he said. Email “U2's Adam Clayton: 'I'm an alcoholic.. that disease drove me towards this wonderful life'”. 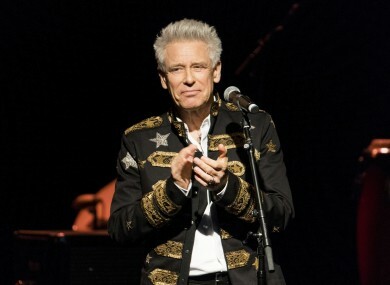 Feedback on “U2's Adam Clayton: 'I'm an alcoholic.. that disease drove me towards this wonderful life'”.